You’ll have all the comfort you need while being close to nature. Whether you’re coming with friends, family, or your partner, our campsite offers 17 4-person mobile homes, ideally located close to services. Recent models are spacious, modern and perfectly functional – all you need for great family holiday time! In our 4-person mobile-homes, the sleeping area is divided into 2 separate rooms (1 room with a large 140 cm-wide bed and 1 room with 2 single beds). Plenty of storage is also available in each room and for even more convenience, the shower room and WC are separate. The kitchen area is equipped with gas-supplied cooking hobs, a fridge/freezer, coffee maker, microwave, and a complete set of crockery. You can choose to eat your meals in the lounge area or on the semi-sheltered wooden terrace. It is strictly forbidden to bring pets into rented accommodation. To make your stay even more pleasant, you can rent a TV, baby kit, gas barbecue, and towels and sheets. ARRIVAL/DEPARTURE POSSIBLE ON SATURDAYS AND SUNDAYS, EVEN IN HIGH SEASON! To benefit from our special offers, go to the Bookings tab. 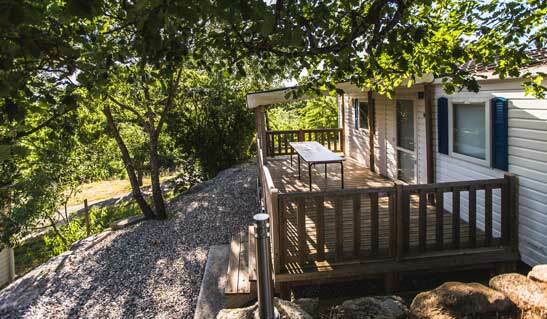 These mobile homes are ideally sized and equipped for your holidays! Whether you’re coming with your whole family or meeting up with friends, our 6-person mobile homes are the perfect accommodation for your holidays at our campsite! They have a sober and modern design, and have a convivial kitchen space, equipped with gas cooking hobs, a microwave, fridge/freezer, coffee maker, and complete set of crockery. There is also a bathroom and separate WC, and 3 bedrooms (1 with a large 160 cm-wide bed and 2 bedrooms with twin beds, one of the bedrooms has pull-out bed, ideal for accommodating a cot for your youngest child). You can choose to eat your meals in the lounge area or on the semi-sheltered wooden terrace. It is strictly forbidden to bring pets into rented accommodation. For optimal comfort, why not rent a TV, baby kit, or a set of bed sheets and towels. And don’t forget you can rent a gas-supplied barbecue on a nightly basis for your barbecue dinners, provençal-style! ARRIVALS/DEPARTURES POSSIBLE ON SATURDAYS IN HIGH SEASON! 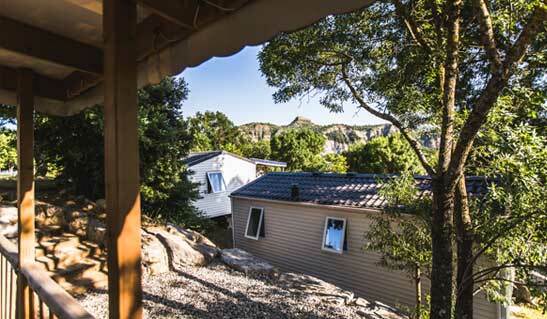 Come and enjoy your holiday at La Chapoulière campsite in one of our ten cosy top-range cabins with a magnificent panoramic view of the Cévennes mountain range and Ardèche River! Large glazed windows and spacious semi-sheltered wooden terraces will offer you unforgettable moments with friends and family, with sunsets that will take your breath away! In addition to the comprehensive inventory of our standard rentals, cabins are equipped with useful appliances for your stay: air conditioning, TV, dishwasher, Dolce Gusto pod coffee machine, kettle. Sit back on one of the two chairs provided on each terrace. Each cabin has one room with a parental 160 cm-wide bed, and a second bedroom with two 90 cm-wide beds, a bathroom with a spacious shower, and a separate toilet. It is strictly forbidden to bring pets into rented accommodation. All bookings made for at least a week-long stay come with 2 free entries to our wellness area (spa & hammam). Enjoy the joys of camping and the pleasures of relaxation. Come and spend your holidays in our 6-person house, located a few metres away from the campsite. Its two terraces, one shaded, will be perfect for your evening meals! This two storey-house has two rooms, one with a 140 cm-wide bed, and a double room with two 90 cm-wide beds, a renovated shower room, separate WC, and a small kitchen equipped with hobs, a refrigerator and freezer, a coffee maker, a microwave, and a full set of crockery. The house has everything you’ll need for a pleasant stay. Lay back on one of our sunbeds and enjoy a delicious meal cooked on your own private stone barbecue. It is strictly forbidden to bring pets into rented accommodation. ARRIVAL/DEPARTURE ON SUNDAYS IN HIGH SEASON! The Taos is for your holidays with family, friends or lovers, the new generation of trendy accommodation, located close to the pool and spa. Enter this design cocooning bubble of 35m2, which will provide relaxation and comfort. After the aperitif took to the lounge area, you can enjoy a good dinner at the dining area, or why not on the terrace of 25m2, in front of a sunset on the mountains? The kitchen is fully equipped with: gas hob, fridge / freezer, dishwasher, Dolce Gusto coffee machine, kettle, microwave and complete crockery set. An upscale rental for 4 people consists of two bedrooms (1 bed 160×200, 2 beds 90×190), including a master suite. These each have their room-water and WC. For even more comfort in Taos you can enjoy air conditioning and television. The cocktail is gathered for you to spend a nice relaxing and pleasant vacation. Animals are strictly forbidden in rentals. The mobil-home with access PMR: space, functionality and user-friendliness! This mobile home with 34m2 contemporary design and high-end services, is designed to accommodate people with reduced mobility. It is located in the heart of our campsite to fully enjoy your holidays. After taking the path gently sloping, you will access the covered terrace that allows you to enjoy the view of the pool and the Cevennes. With all the comforts for a successful holiday: kitchen (4 gas burners, fridge-freezer, dishwasher, coffee maker, kettle, microwave, complete crockery), TV and air conditioning. The set is designed to preserve a great deal of autonomy and easy wheelchair traffic. A large master bedroom with bed 160, and children’s room with 2 bunk beds 70×190. Bathroom with shower, WC adapted for people with reduced mobility. Animals are strictly forbidden in rentals. ARRIVAL/DEPARTURE ON SATURDAY IN HIGH SEASON!